Urgent Call to Action: Tell Gov. Cuomo to Fix His CDPA Mistake! As you know, in his budget proposal for 2019-20, Governor Cuomo unleashed an unprecedented attack on seniors and the disabled, repealing the state’s popular and successful Consumer Directed Personal Assistance (CDPA) program and replacing it with a watered-down version that will eliminate over 550 fiscal intermediaries across the state for no reason, slash funds for non-PA wages for those FIs that remain by over 500%, and begin the process of shifting to one entity for the entire state that will run the program with all the warmth and heart of your local cable company. Since the budget was released, the outcry against this measure has been enormous. The disabled, seniors, family members and others have rallied to save the program. An enormous crowd showed up in Albany yesterday to call on their Legislators to stop the cut. Now Governor Cuomo has a chance to fix this mistake. In mid-February, he will amend his budget proposal in a Constitutional process known as his 30-day amendments. We must use this opportunity to demand that he use this Constitutional procedure to fix his mistake and prevent 70,000 consumers and 100,000+ personal assistants from having their lives irreparably harmed. This is his chance to make this right. This is his chance to stop this crisis before it happens. Take this opportunity to tell him that enough is enough, we need to stop the war on the disabled and seniors who use this program. A program that New York developed and has since turned into a national model. Let’s build on the momentum we have going. 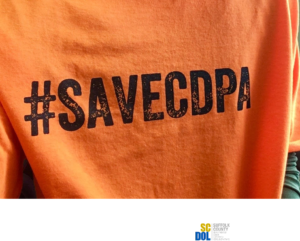 Tell Governor Cuomo to fix his CDPA mistake, before it is too late.